Headphones are like pieces of art: while the real connoisseurs can spend a fortune on them, for most folks, budget models work just as well. Just like art, there’s a big difference between finger painting and Picasso – with a happy medium somewhere in between – and the same is true for headphones. We’ve sort of built a reputation for covering all of the latest, greatest and priciest technology in the world. However, even in the face of all of that high-end equipment, we still have a passion for finding great tech items that anyone can afford, and the best cheap headphones are a great place to start. Update: If you’re looking for a premium noise-cancelling headphone and don’t want to shell out for the flagship models from Bose and Sony, check out the JBL Live 650BTNC – it’s available right now for $199 on Amazon! 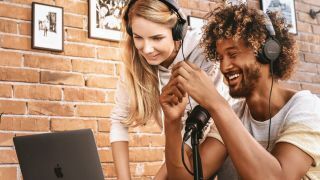 It’s this passion for affordability that inspired us to create this list of the best cheap headphones on the market in 2019 – we’ve put our bargain-hunting prowess to great use and found a great deal of cheap headphones that you can buy without thinking twice about it. By their very nature, the headphones you prefer will ultimately boil down to your own personal taste. However, seeing as the headphone market is extremely saturated, it is genuinely hard to figure out what the best headphones for your tastes actually are. That’s where we come in. Now, bear with us – it’s impossible to get our hands on every affordable pair of headphones, but we won’t recommend anything we haven’t used ourselves. So if we missed your favorite pair of headphones, it wasn’t on purpose, we assure you. With this guide, we went through a process – exhaustively testing a huge amount of cheap headphones from all over the internet in every style under the sun. In-ear, over-ear, wireless – everything you can think of. We then took the results of all of this exhaustive testing, and measured each headphone against each other until we could confidently pick a few to proudly wear the ‘best cheap headphones’ badge. So rest assured, even if we didn’t pick your favorite headphone, there isn’t a single pair in this list that will disappoint. While wired headphones may be way of the dodo with disappearing headphone jacks, there are still plenty of reasons to go wired. Two of the biggest reasons is sound quality and price. While there are cheap wireless headphones out there, they sound much worse than wired headphones for the same price. 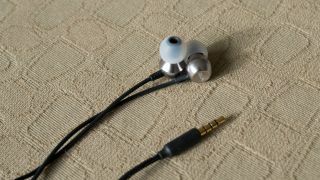 In the budget in-ear headphone category, you usually sacrifice sound and build quality for price. However, there are rare gems that are affordable, sound great, and are built well. The RHA MA390 is one of those headphones. While the RHA MA390 is the cheapest headphone the company makes, it doesn’t sacrifice on build quality, design, or sound: These headphones are beautifully crafted out of aluminum, feature a braided cable, and a universal remote that works with Android and iOS. While not perfect, the RHA M390 are an excellent value in the budget in-ear category. The OnePlus Bullets Wireless are an excellent pair of wireless headphones, especially considering that you can get them for $70 (£70, about AU$124). At this price, no other neckbud comes close. 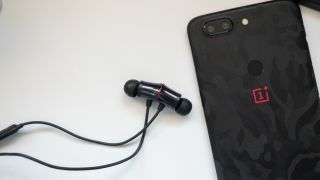 The OnePlus Bullets Wireless are so good, in fact, that they’ve unseated the NuForce BE6i and Beats X in our list of the best wireless earbuds. This is a pair of wireless earbuds that we have no hesitation recommending to anyone. It was love at first listen with the Skullcandy Grind. These bass-heavy headphones bring a built-in microphone to the mix and offer amazing sound quality at a bargain basement price. They do everything we want in a pair of on-ear headphones – they’re light, but not fragile. They’re powerful, but are directional enough that sound doesn’t spew out everywhere, alerting your neighbors that you’re listening to Taylor Swift again. 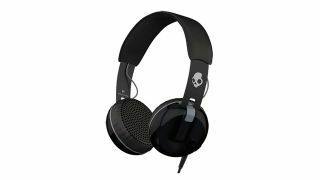 If Skullcandy’s low-end-heavy tone and teenager-esque style aren’t for you, there’s always the equally good – a more balanced pair of on-ears that cost almost exactly the same amount as the Skullcandy Grind. As great as wired headphones can be, being constantly tethered to your phone, MP3 Player or PC can be downright irritating. If you find yourself ready to tear the cord out of the jack once and for all, you need a pair of wireless cans. For those looking to cut the cord on the cheap, the Creative Sound Blaster JAM is the way to go. It’s lightweight, sounds great and is dirt cheap. What makes it on-ear headphones? Well, the foam earpads sit directly on top of your ears instead of encompassing them entirely, something some folks find more comfortable. 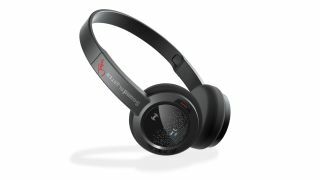 Our only real complaint about the Creative Sound Blaster JAM is that, because they’re on-ear headphones, they let in ambient noise like no one’s business. This is totally fine for the dull roar of an office (and might even be helpful if someone needs to grab your attention real quick) but, for commuters or anyone who can’t stand to hear the outside world while listening to their tunes, you’re best served looking at one of the over-ear options coming up on the list. It’s easy to spend an arm and a leg on good over-ear headphones. Barring the exception of noise-cancelling and planar magnetic cans, they are the top dogs of the audio world. Really good over-ears should be the most comfortable, most versatile headphones in your audio arsenal. They should be just as adept with Hi-Def audio sources of 16-bit/44.1KHz as they are streaming from Spotify, and they should do so without sacrificing either end of the audio spectrum. 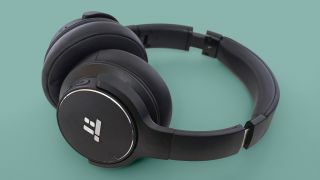 In our testing we found a half-dozen that can do the job (the Status Audio CB-1 come to mind, as do the Sennheiser HD201 and Audio-Technica ATH-M20X) but, of them all, the Monoprice 8323 Hi-FI DJ Style Headphones are the cream of the crop. They’re a bit cheaper constructed than the others, but for their price they sound outrageously clear. 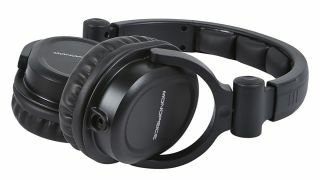 Balanced and powerful, the Monoprice 8323 is the epitome of what the best cheap headphones should be. If you’re not wedded to the idea of owning full-size headphones, there’s quite a lot of competition worth considering around this price. However, you can’t argue with the Taotronics TT-BH040s’ value: While not packed with character, they carry themselves with a premium look above the affordable price tag, with aluminium touches and a generally pleasant design. From a distance, and even close up, few would guess they are so affordable … just don’t buy them expecting the same performance as the most desirable pairs from Beats, Sennheiser or Bose. Beyerdynamic makes loads of equipment for both audiophiles and audio professionals, and some of it comes at a high price. But, the Beyerdynamic DT 240 Pro headphones find a sweet spot offering professional audio and a high standard in design for a lower price point. The DT 240 Pro headphones cost $99 (£89, AU$139), making them more affordable than heaps of other studio monitor headphones. This price puts them in close competition with some of Audio-Technica’s cans, like the widely praised ATH-M40X or the wireless ATH-SR5BT, which can be found on sale in the same ballpark as the DT 240 Pro. Beyerdynamic shines in performance with the DT 240 Pro. As studio monitor headphones, the sound produced is not very colorful, but that’s exactly as it should be. All the sound comes through clean and incredibly well balanced. The bass is easy to pick up on without being thumpy, though with a subtle punch at higher volumes. From the bass on up to the high end, all the sounds mesh clearly, with the DT 240 Pros not boosting one register over the other. They’re neutral, perfect for recording and best of all, cheap. In order to create this guide, we’ve tested, listened to and compared over 25 headphones in every category, shape and size. When we found a great pair, we then put it against the rest back-to-back-to-back to make sure they still really deserved the title of ‘best cheap headphones’. You might be wondering what we were looking for through all this expansive testing? Sound fidelity was clearly the most essential detail – but we also made sure to consider comfort, design and other features also. Like most people, we prefer our music detail-rich and well-balanced. We can live with our music sounding a bit warm with an emphasis on the mids and highs, but we still like to be able to feel the bass. Also, it’s important to look for headphones with reasonable battery life if they’re wireless, a robust, durable build that will stand up to the trials of everyday commute and comfortable padding to help make longer listening sittings nice and comfortable. Keep in mind though, that testing headphones will be, at least on some level, subjective, and our taste in tonal balance might not match yours (neither will the size of our head or the shape of our ears). Still, we’ve done our best to take subjectivity out of the equation and can present, through our expertise, the best cheap headphones that won’t hurt your wallet.